This latest volume in the Harvey Lectures Series reflects "the evolution of physiology and physiological chemistry into biochemistry and the development of molecular biology from the roots of bacteriology and biochemistry" in the 20th and 21st centuries. This lecture series, collected and published annually, provides a series of distinguished lectures in the life sciences by world-renowned scientists in all areas of biomedicine. These lectures occur in New York City throughout the course of each academic year. CONSTITUTION OF THE HARVEY SOCIETY. BY-LAWS OF THE HARVEY SOCIETY, INC.
OFFICERS OF THE HARVEY SOCIETY. 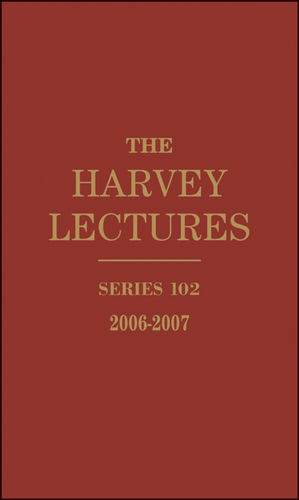 PREFACE: A BRIEF HISTORY OF THE HARVEY SOCIETY, NEW YORK. DRUGGING THE "UNDRUGGABLE" (Gregory L. Verdine, Ph.D., Erving Professor of Chemistry, Department of Stem Cell and Regenerative Biology, Chemistry and Chemical Biology, and Molecular and Cellular Biology, Harvard University, Cambridge, Massachusetts; Director, Chemical Biology Initiative and Program in Cancer Chemical Biology, Dana-Farber Cancer Institute, Boston, Massachusetts). BASAL BODIES: THEIR ROLES IN GENERATING ASYMMETRY (Susan K. Dutcher, Ph.D., Professor of Genetics, Department of Genetics, Washington University School of Medicine, St. Louis, Missouri). PROTEIN TRANSPORT IN AND OUT OF THE ENDOPLASMIC RETICULUM (Tom A. Rapoport, Ph.D., Professor, Howard Hughes Medical Institute and Department of Cell Biology, Harvard Medical School, Boston, Massachusetts). SIGNALING NETWORKS THAT CONTROL SYNAPSE DEVELOPMENT AND COGNITIVE FUNCTION (Michael E. Greenberg, Ph.D., Professor of Neurology, Professor of Neurobiology, Children’s Hospital Boston, Program in Neurobiology, Harvard Medical School, Department of Neurobiology, Boston, Massachusetts). CILIA AND HEDGEHOG SIGNALING IN THE MOUSE EMBRYO (Kathryn V. Anderson, Ph.D., Program Chair, Developmental Biology Program, Sloan-Kettering Institute, New York, New York). DERIVATION OF ADULT STEM CELLS DURING EMBRYOGENESIS (Leonard I. Zon, M.D., Grousbeck Professor of Pediatrics, Children’s Hospital Boston, Howard Hughes Medical Institute, Boston, Massachusetts). TRACKING THE ROAD FROM INFLAMMATION TO CANCER: THE CRITICAL ROLE OF IκB KINASE (IKK) (Michael Karin, Ph.D., Distinguished Professor of Pharmacology, Laboratory of gene Regulation and Signal Transduction, Departments of Pharmacology and Pathology Cancer Center, School of Medicine, University of California, San Diego, La Jolla, California).